A Rainbow In My Tummy® classroom may look different than your typical classroom. We incorporate family-style meal service and emphasize healthy toys and environmental print that represent real, healthy foods. We incorporate nutrition education in all aspects of our curriculum. Nutrition education is often incorporated during mealtime and teachers discuss topics from how strawberries are grown to the importance of recycling. Family-style meal service is an integral part of successful Rainbow In My Tummy® implementation. Using this approach, meals become more relaxed as adults engage in casual conversation with the children as they share the meal together. Family-style meal service fosters independence by allowing the children to choose their own portions, serve themselves and clear their own place when done. This experience encourages positive child-teacher interactions and children hone fine motor development, gain independence and feel a sense of pride in their accomplishments. The Child Development Specialist and the Rainbow In My Tummy® Director at Verner have written a formal Rainbow In My Tummy® adult learning curriculum to support a healthy food culture in early care and education centers. ​The curriculum includes engaging, developmentally-appropriate classroom activities for centers that have implemented Rainbow In My Tummy®. During implementation, we provide classroom assessments to ensure the environment supports a healthy food culture. For example, healthy play foods will be placed in the dramatic play area and puzzles and books will reflect healthful living. 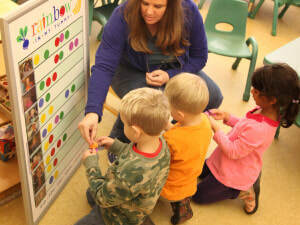 Before implementing the program, we assess classrooms and provide recommendations of “healthy” toy replacements. 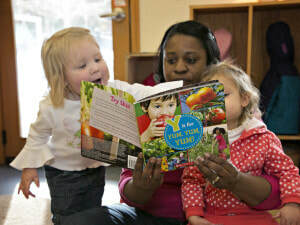 We also host training opportunities for educators on nutritional literacy, classroom activities and family-style dining. This is a critical component to successfully shifting the food culture in the classroom. 1. Take a healthy field trip. Visit a local farm or farmer’s market. Can’t leave your building? Invite in a farmer or avid gardener to talk to your class. 2. Model healthy eating. Eat what your children are eating and enjoy the healthy foods. Talk about how yummy a food is to encourage children to try new foods. 3. Start a conversation about the food during mealtime. Talk about the foods on the plate and where they come from. 4. Grow a small herb garden. Plant seeds in small cups and place in your classroom window. Watch them grow! 5. Try new foods together. Children will be encouraged to try new foods when they see their teacher and friends trying it too. 1,2,3 take a bite! 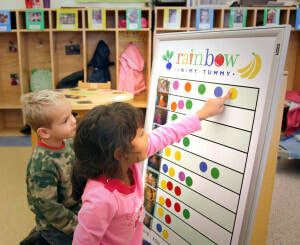 Consider incorporating a white board where children can track the different colors of food they are eating. Do they have a rainbow of foods in their tummy? Rainbow In My Tummy® isn’t just improving the quality served to young children. While this is a fundamental piece of our program, we want to educate children on where our food comes from, how it is prepared and even where it goes when it leaves the table. We want to provide a foundation so that children can form a healthy relationship with food. Classrooms integrate nutrition education in the classroom in their environmental print, classroom centers and engage children with healthy activities like Discovering Real Foods and “The Kitchen Interview.” Below you will find a list of resources that relate to nutrition education that can support in the classroom or even at home. 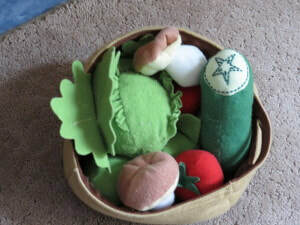 In the block center, provide props so children can talk about where our food comes from. Bean Sensory Activity - talk about color, feel, texture and taste. Bring in guests - parents, farmers or chefs to learn about nutrition. 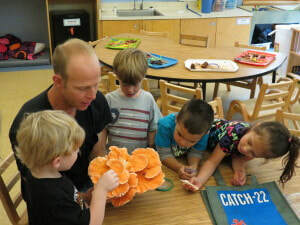 Pictured are children exploring the "chicken of the woods" mushroom. Include books about food, farming and health living in classroom libraries. Simple food matching activity. Cut out pictures of foods, then glue to paper and laminate! Incorporate "real foods" into dramatic play area. Track the "rainbow" of foods each child eats every day.